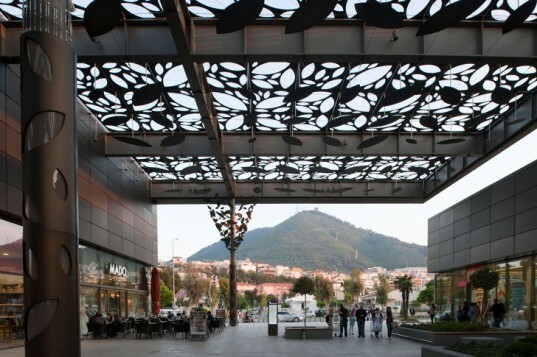 The Asmaçatı Shopping Center in Izmir, Turkey is a place where sustainability, public space, shopping and street life complement each other. Designed by Tabanlioglu Architects, the modern shopping center encourages people to spend time outdoors with its shady courtyards and outdoor dining areas. This mix of shopping and social areas places a strong focus on the outdoors and encourages connections between a diverse range of people. Asmaçatı Shopping and Meeting Point is a semi-open shopping facility in Balçova, Izmir, Turkey. Inspired by the climate and the Aegean tradition of spending time outdoors, the shopping center is an enjoyable place to shop, meet, rest and eat. Teens, families and friends alike can all enjoy the space. Asmaçatı SMP is located at a critical juncture between the sea, the mountains and a well-used road that accesses many people’s summer homes. Whether visitors are on their way to and from weekend vacations or stopping by for everyday shopping, ASMP offers an enjoyable space to meet and shop. 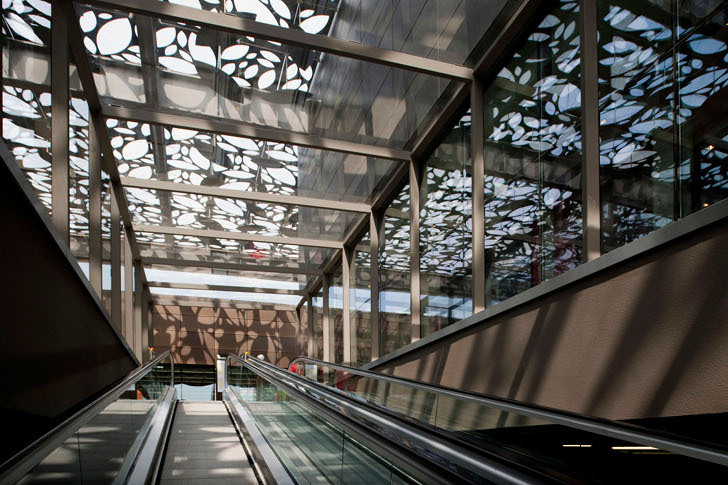 The center is anchored by a large hypermarket store and features 18 boutique shops and restaurants. The form references traditional gazebos, which are usually covered in ivy leaves on the top and the sides. Large metal shade screens perforated with leaf shapes cover the walkways, dining patios and a courtyard to provide shady places to rest. Natural ventilation, daylighting, and plentiful planters create a pleasant microclimate. This permeable space combines sustainability, retail, open public space, recreation and street life into an enjoyable outdoor atmosphere for all to enjoy. Asmaçatı Shopping and Meeting Point is a semi-open shopping facility in Balçova, Izmir, Turkey. Inspired by the climate and the Aegean tradition of spending time outdoors, the shopping center is an enjoyable place to shop, meet, rest and eat. Teens, families and friends alike can all enjoy the space. Asmaçatı SMP is located at a critical juncture between the sea, the mountains and a well-used road that accesses many people's summer homes. Whether visitors are on their way to and from weekend vacations or stopping by for everyday shopping, ASMP offers an enjoyable space to meet and shop. The center is anchored by a large hypermarket store and features 18 boutique shops and restaurants. The form references traditional gazebos, which are usually covered in ivy leaves on the top and the sides. Large metal shade screens perforated with leaf shapes cover the walkways, dining patios and a courtyard to provide shady places to rest. Natural ventilation, daylighting, and plentiful planters create a pleasant microclimate. This permeable space combines sustainability, retail, open public space, recreation and street life into an enjoyable outdoor atmosphere for all to enjoy. The project has a site area of 22.763 m² and a construction area of 41.450 m². ASMP was completed in 2011. The shopping center is a model concept for future developments.